Turning away from stage to screen adaptations for once (1*), the team of Clifton Ko and Raymond To turned to a literary source for One Of The Lucky Ones. Namely Lucy Ching Man-Fei's autobiography that details how she became the first visually impaired Chinese woman to attain a University degree. Played by Alice Lau (2*), Ko, working as usual from a Raymond To penned script has little goals and that is the only goal a motion picture of this kind should have; to inspire. Of course, just because you have an inspirational story doesn't mean you can automatically make one and while the team of Ko/To succeeds quite well, they were either hard pressed for time in completing the film or impatient men themselves. Don't take that the wrong way as again, an inspirational story is still an inspirational story but Ko seems to be in awful rush through even this vital part of Ching Man-Fei's life. He runs down the checklist, portraying the outside world of Canton as rather evil towards the visually impaired and punches quite hard to make sure we understand these points. I expected more of a heavy hammer in all honesty but that doesn't cancel out the rushed nature to a visually calm film. The pace becomes less of a problem as soon as Ko concentrates fully on Ching's desire to study and do well for her family. Expectedly, she inspires her surroundings and everyone become better people in the process but thankfully a focus lies more on the relationship between Ching and family maid Wo. Basically her surrogate mother (not that the mother played by Law Koon-Lam is in any way bad) and trusted assistant, she injects a good natured spirituality into Ching that carries on through the bad times that follows. As melodramatic as scenes turn out, director Ko has made sure to inject plenty of warmth and simplistic themes for One Of The Lucky Ones to come out on top in its own way when in these story strands. Without a emotional anchor, or rather two in this case, any film such as this one would've fallen flat and full of confidence in his leading lady from I Have A Date With Spring, Ko enlists the luminous Alice Lau once more to great effect. Being directed towards the all too big emotional outbursts at times, Lau overcomes directorial flaws by embodying Ching Man-Fei's positive aura to desired effect. It doesn't look like much, that's the criminal part, but it's also wonderful on an unconscious level to be immersed into this portrait, thinking it's Ching Man-Fei who ultimately emerges there on screen. Yet it's not, which is even an even more wonderful testament to Alice's skills. Co-star Hui Fan seemingly got into movies at a very late age and is an inspired casting choice. Having no problem dedicating herself to the dedicated nature of Wo, the chemistry with Alice is just right, hinting at many levels of depth in the character that Ko doesn't opt to explore, yet doesn't have to. It can be read through any interaction with Alice but it's depth there for the taking if you choose to. The Clifton Ko/Raymond To's stable of actors such as Law Koon-Lam, So Yuk Wa, Fung Wai Hang, David Ng (in an all too short role) and Teddy Yip are on board as well. Filmed without much pretentiousness (some flashbacks in grainy black and white represents that excursion but they're not intrusive), that is what saves One Of The Lucky Ones compared to similar in tone movies like I Am Sam where we were drenched in film school sensibilities of the grating kind. On the other hand, Clifton Ko and Raymond To were clearly on a restrained budget but even the big outbursts like the effects of air raids only deserve aftermath shots. It shouldn't draw focus away from a core story. Telling it with a bit more substance filled into certain gaps here and therefore perhaps creating a 100 minute film would've been welcome but for what it is, One of The Lucky Ones does what it sets out to do overall, which is to affect a movie audience after seeing an individual do the same to her surroundings in real life. Nothing wrong with that. Also available from Universe, Megastar's dvd edition has the extra leverage in the form of a 1.75:1 framed anamorphically enhanced transfer. Print is clean but colours and sharpness never comes off particularly well. Perfectly watchable though and affordable. Cantonese audio is presented in original mono (Dolby Digital 2.0) and only suffers from some crackling noise at the beginning and end of the film. Otherwise, it sounds very clear. A Mandarin 2.0 dub is also included. The English subtitles has minor grammar errors only but are absent during a few moments, including the end crawl that presumably talks about Ching Man-Fei's life after she leaves for America. Traditional and simplified Chinese subtitles are also available. Only extra is the trailer. (1) The winning I Have A Date With Spring had already made ripples at the box-office that year and was going to at the Hong Kong Film Awards as well. Also see The Umbrella Story and The Mad Phoenix for more Clifton Ko/Raymond To reworking's of their stage plays. 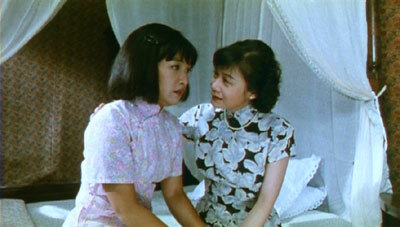 (2) Alice Lau was active in the 80s but seemingly got her breakthrough working with Clifton Ko and Raymond To. Hence getting the Best New Artist Hong Kong Film Award for her performance in I Have A Date With Spring. Other movies includes Sea Root, The Umbrella Story and Farewell My Dearest.